Parsons gives an action packed portrayal of human smuggling, mass migration and 21st century slave markets. The story is set in London, England and begins in the heart of Chinatown where a refrigerated truck is found parked with twelve, female, illegal immigrants inside, all but one dead from hypothermia. In the cab of the abandoned truck DC Max Wolfe finds thirteen passports. Where is the thirteenth woman? His search leads him to crime moguls both old and new and the story concludes with a surprise twist. 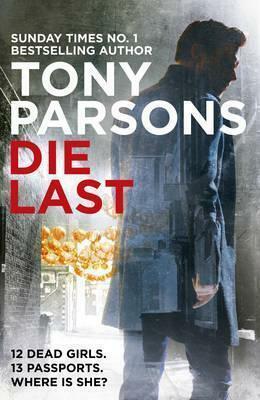 The story is told by DC Max Wolfe in the past tense and moves along at a good, page turning pace. The realism of the crime world and the voice of Max make it a very believable tale. There are a few scenes of brutal violence in the story, which I imagine are true to life, but were, nevertheless, difficult to read. Clemency Pogue is a bright, only child who pays particular attention to the stories that are told around the dinner table in the evening. It is this that has saved her from a terrible fairy whom she kills by yelling, “I don’t believe in fairies,” a line she heard in the previous night’s story telling time. The problem is, she has also inadvertently killed six other fairies. Fortunately for everyone concerned, Clemency finds herself with a hobgoblin for a friend when s he accidentally utter his true name. the two tear off in a flurry of soil from one end of the Earth to the other to rectify her mistake. One of the wonderfrul things about this short novel is that it not only will capture the imagination and excitement of children aged 8 to 12, but the word play that JT Petty uses makes it absolutely delightful, humorous and engaging for adults as well. I wouldn’t hesitate to recommend this book to children and the adults who read to them. Depuis plusieurs semaines, Léa est amoureuse de Bruno, le plus beau gars de l’école. Quel bonheur! Et elle croit que Bruno l’aime aussi. C’est le paradis! Au point òu, avec lui, elle se sent prête à tout. C’est tellement important, la première fois. Ensuite, rien ne sera plus pareil, pense Lèa. Mais est-ce aussi simple que ça? Et si Bruno ne l’aimait plus? Avec la bande de sirènes qui tournent autour de lui, on ne sait jamias. Après Le coeur en bataille et Je t’aime, je te hais…, Lèa se rend compte qu’il y a tout un monde entre le paradis et le septième ciel. Sauve qui peut l’amour, un roman d’émotions, intense et beau comme un premier grand amour. L’histoire d’amour de Léa et Bruno est racontée par Léa, au temps présent. Ce livre montre les difficultés rencontrées autour du sexe par les adolescents, le divorce, la fidelité et la reconciliation d’une manière sympatique et sans jugement. Dans ce court livre de 158 pages j’ai trouvé les personages crédibles. Leurs émotions étaient réalistiques et les dialogues naturels. Il y avait beaucoup d’actions mais l’histoire était très interessante néanmoins. J’ai trouvé la vocabulaire un peu difficile mais c’était une bonne façon d’apprendre des nouveaux mots et phrases. Sauve qui peut l’amour est un bon livre pour la jeunesse et les adultes. The first in Pullman’s award-winning series, The Golden Compass is a multi-layered novel that is fun as well as thought-provoking. The hero, Lyra is pulled from her mundane existence at Oxford where she adventures to the far North searching for her friend Roger; where witch clans and armoured bears rule, where the Gobblers take the children they steal—and run experiments, and where her fearsome uncle Asriel is trying to build a bridge to a parallel world. The story is set loosely in our world and in a fantasy world, where every human being has a “daemon” that is a physical manifestation of that person’s soul in the form of an animal that is connected to the person. Along the way, Lyra meets talking bears, flying witches, and more. themes and conflicts in the novel involve political and cultural clashes, sometimes gruesome action, and complex characters. The novel explores themes about the relationship between religion and science, the examination of class differences, and the transition from innocence to experience. This book is recommended for ages 12 and up. Controversial points: Some argue that the vocabulary is challenging, and that the political conflicts in the story might more suitable for older readers. Outstanding points: This is a well written escapist fantasy akin to the Harry Potter series. It is laden with complex political and social intrigue that is well written and thoroughly enjoyable.